Home » Oak Flat land exchange headed for a Committee Vote May 15 -- Act Now! 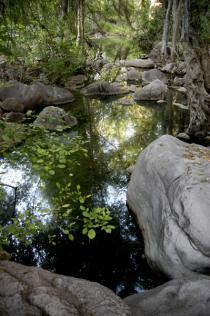 Oak Flat land exchange headed for a Committee Vote May 15 -- Act Now! Gaan Canyon PoolsPlease take action now. Click here for action alert. On May 15th, the US House of Representatives Natural Resources Committee will be voting on the Oak Flat land Exchange, HR 687. This new version, HR 687, is virtually identical to last year’s version of the land exchange (HR 1904). This is the 12th version of the land exchange that Rio Tinto has convinced Arizona members of Congress to introduce on their behalf, and is every bit as bad as HR 1904, which was the worst of the lot. There are many reasons that this bill is a bad idea and should be voted down in Committee. Please contact your Representative and tell him or her to vote no on HR 687, the Oak Flat land exchange. The Oak Flat land exchange (HR 687) would be the only bill that would turn over a Native American sacred site on public land to foreign mining companies and is opposed by every Indian Tribe in the United States. The Oak Flat land exchange (HR 687) would be the largest loss of public lands recreational climbing opportunities in history and is opposed by the Access Fund and other organizations that care about maintaining recreational opportunities on public land. The Oak Flat land exchange (HR 687) bypasses the normal process of permitting mines on public lands, avoids the NEPA process, and would destroy wildlife habitat and clean water resources. Rio Tinto is now openly saying that a mine at Oak Flat is far from a done deal. Until Rio Tinto makes up its mind and receives the permits it would need to mine, there is no good reason for Congress to approve the land exchange. Please take action now. Click here for action alert.